John Larkin, author of 22 books, visited Galen Junior School last Thursday and Friday. 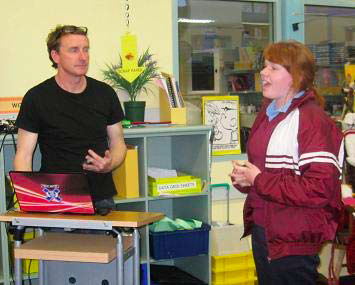 John presented to both Year levels as a group and ran six writing workshops for selected students. He talked about writing as taking small moments of your life and expanding on the detail. He said that everyone had stories within him or her. His presentation was a humorous account of some of the details of his life including his experiences as a child with an Irish mother, and his family life now with a Eurasian family. He spoke of his visits to places in Australia as an author and how many of these situations form the basis of his stories. John’s workshops gave the students a specific structure to follow with their writing. He spoke of sub texts and allowing the reader to construct the story, rather than the writer telling everything.